SanDisk has determined that fewer than 50 percent of users are backing up data regularly – and probably far fewer than that by other estimates. In fact, a scary 62 percent of respondents say computers are their long-term storage plans rather than backup devices. The company has launched a USB flash drive that comes with backup software included so you can back up your PC at the press of a button. No software installation is needed while security is offered in the guise of a dual layer of security, including password-protected access control and ultra-secure AES hardware-based encryption. 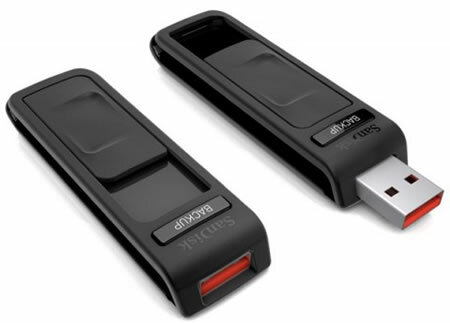 The SanDisk Ultra Backup USB portable flash drive as it will be called is the first offering of the company’s new SanDisk Ultra USB product line and will come in sizes up to 64 GB. The SanDisk Ultra Backup drive will be available in capacities of 8GB-64GB and cost between $39.99 and $199.99.